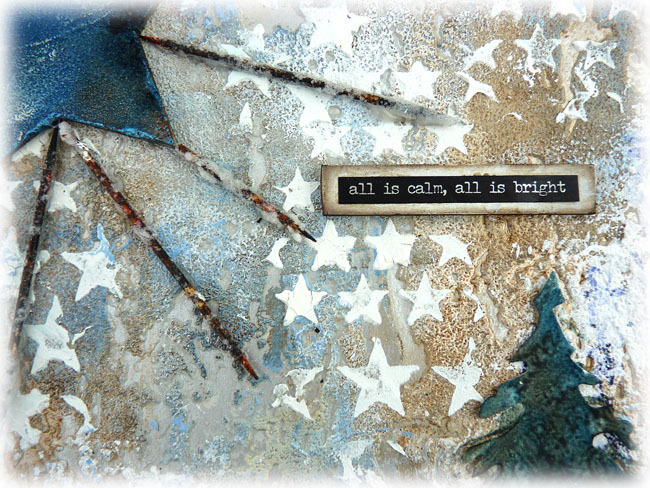 Today begins a new challenge at A Vintage Journey and I have a project to share today that came about as a result of a Skype crafting session with two great team mates Nikki and Alison. The lovely Julia is hosting and describes the challenge for us. So here is my make. I used a piece of wallpaper off-cut picked up from Wilkinsons. You can see it is very textured with silver in the background. After I had adhered it to the background I used a sandpaper bloc to take any excess off of the edges and to distress them pulling and rolling them back with my thumbs. 2. B - Use the monoprint method to add colour medium. 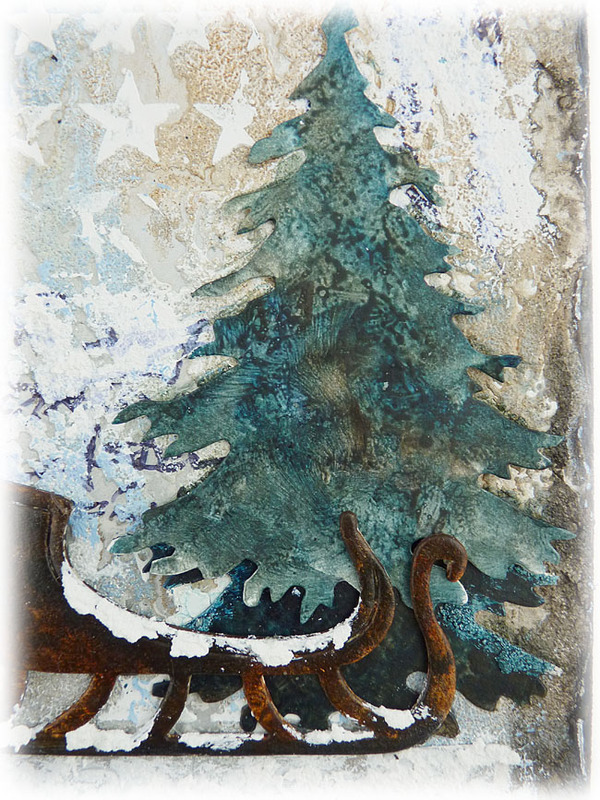 I used a gelli plate with titanium white, cobalt blue hue, burnt umber and titan buff. 3. N - Add a wash or washes of a color medium. I used burnt umber Amsterdam acrylic ink mixed with water and randomly painted over the surface and then used the same colour mixed with a little carbon black media paint and washed the edges to start creating a framed effect. 4. A - Use a stencil. 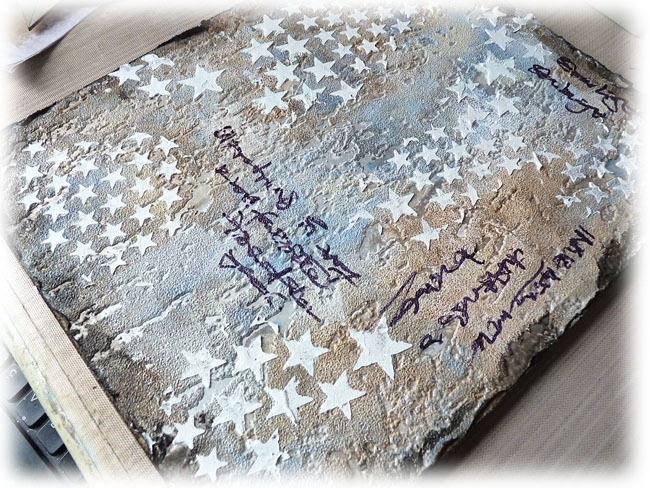 I mixed white gesso, white modeling paste and glamour dust and spread through the TH stars stencil with a palette knife. 5. B - Use asemic or dynamic writing to add a layer of visual texture. 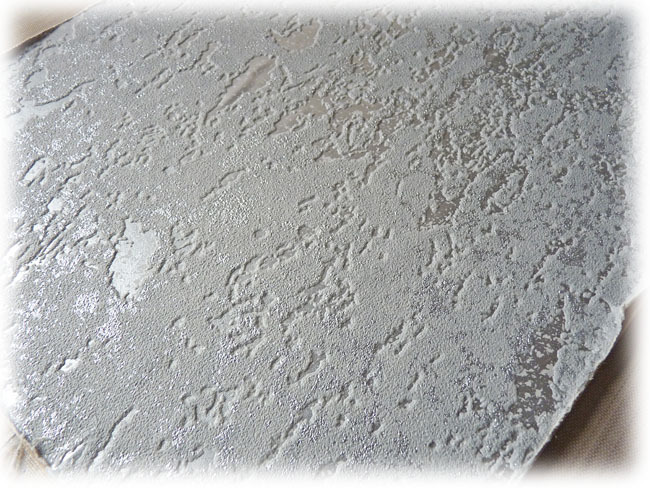 The textured wallpaper is soft like a sponge and the fine black sharpie wouldn't leave any marks so I used a much thicker one which came out rather strong. I didn't panic!!!! 6. N - Add a bit of texture. 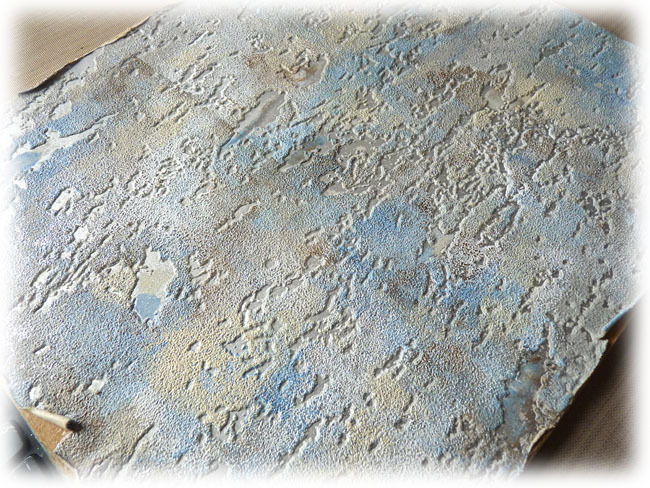 This was a perfect step for me as I went back to mono-printing but with card this time to add textured white gesso and pale blue gesso over the writing and knock it back. 7. A - Determine and prep your focal point. It was here the photos stopped as I was working totally in the moment, designing and composing. 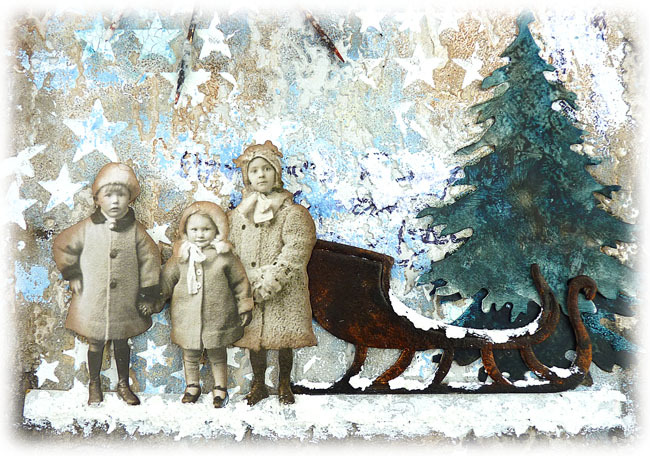 I started with the paper dolls and a die-cut sledge pulling together a scenic composition. 8. B - Find elements to bring the composition together. 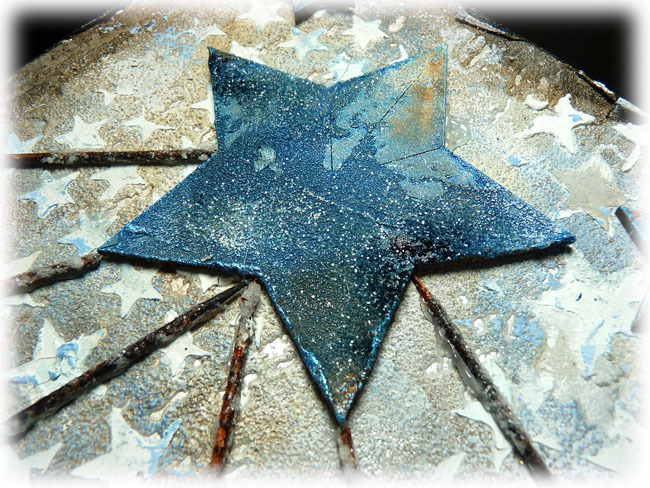 I had a packet of my Tando stars on the table as I thought I was going to go with a Christmas theme, although this turned out more wintry in the end. I also die-cut the TH evergreen tree and painted it ready to add to the scene. 9. N - On one or more of the elements use two different mediums of the same colour. 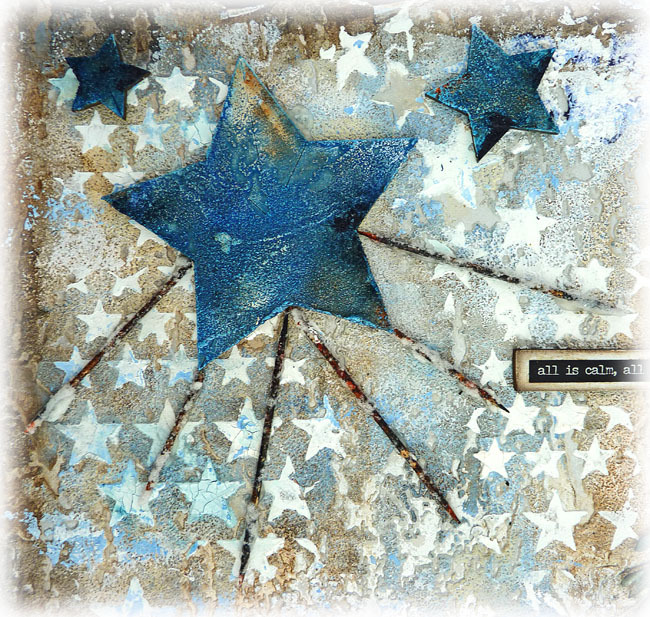 I coloured up texture sand paste with cobalt blue and paynes grey media fluid acrylic and plastered over the stars then painted over with decoart metallic ice blue. 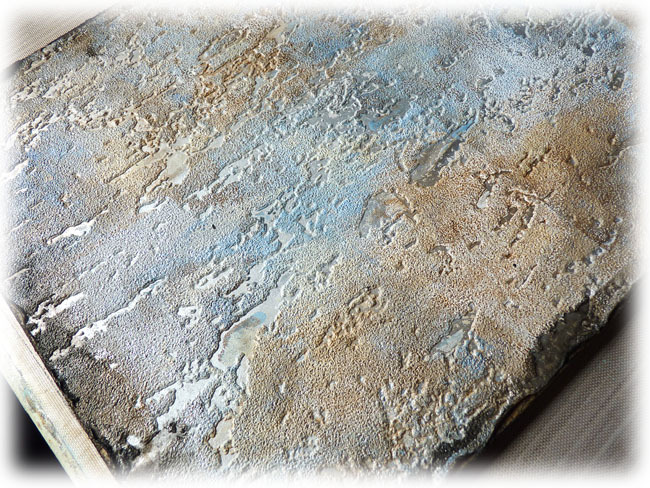 Next I gently rubbed over some everlasting chalk paint and pooled a quinacridone gold watery mix into the recesses then finished off with a smattering of cosmic blue metallic lustre and some prussian blue hue in a couple of smaller areas. 10. A - Add some words. I had bought some of the metallic seasonal words by TH when I was in America recently and I painted a piece of greyboard and mounted my saying on that. 11. B - Add some sparkle. 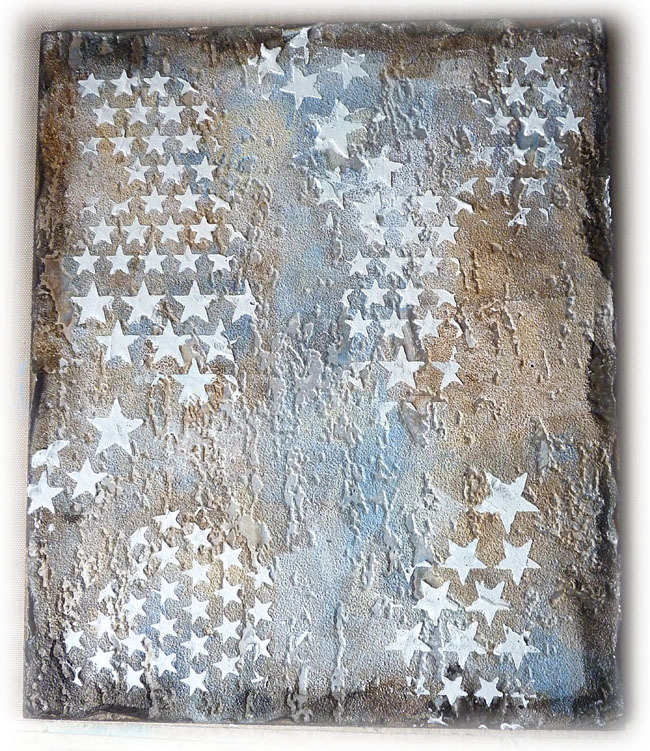 I had already added glamour dust in with the modeling paste and gesso when I stenciled the white stars but I also adhered some distress glitter to the blue stars but this proved to be very difficult to capture on photo but the white specks are actually the distress glitter reflecting in a bright light. 12 N - Assemble and add whatever you need to finish off your design. 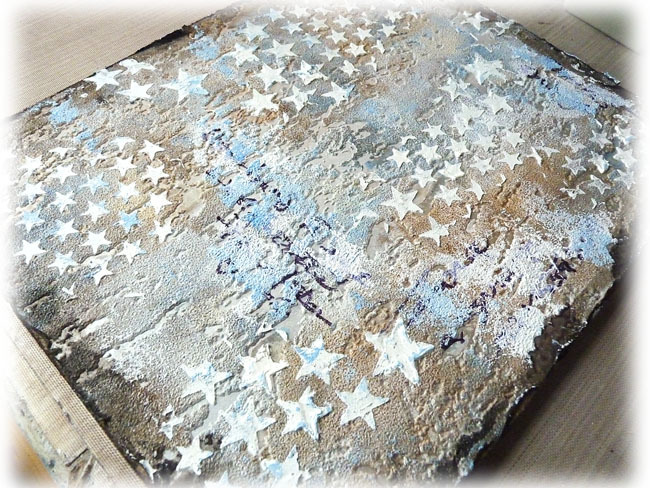 As I was working I had rolled some wooden tooth picks in the browns and blue paints on my palette and then mixed more glitter with some decoupage sealer and rolled them in that and left them to dry. I was able to add these as the light rays from the stars. 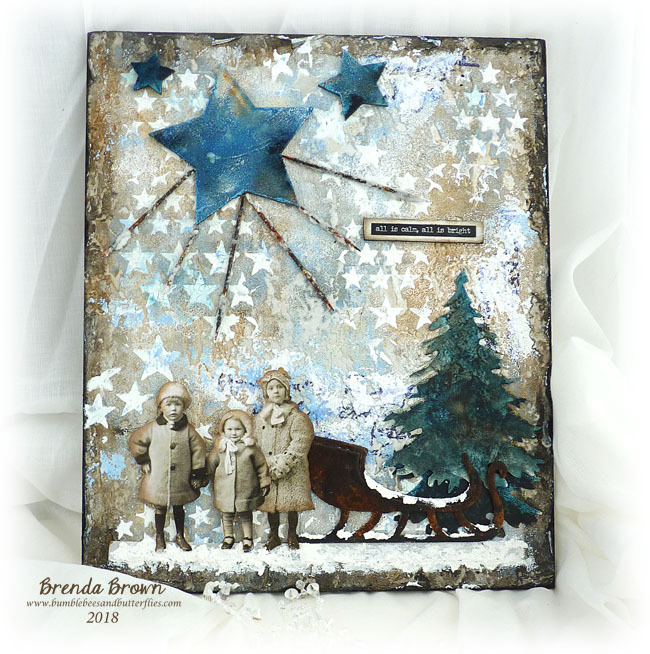 I also found a silvery painted piece of card which I cut and covered with snowtex to build a snowy path for the sledge and children to stand on. I always have a tendency to spend ages on small details so the last step was to resist - not use the technique but to cease from adding.any more!!!!! I ended up feeling really pleased with the finished board especially as we finished at 2.07 and had started just before 10.00 am. For me that's really good going I would normally go into a second day to achieve something like this. It just shows we can produce things and complete them much faster when working with friends. 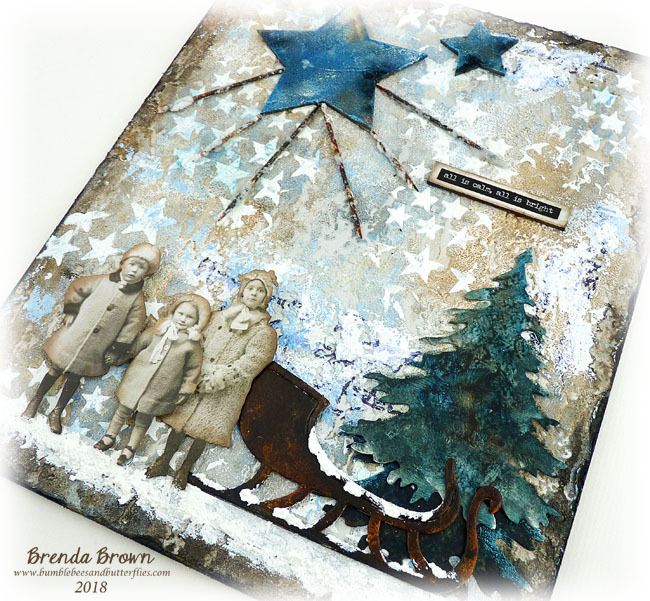 I hope you can pop over to A Vintage Journey to not only see both Nikki's and Alison's masterpieces but more from the very talented Creative Guides. So great to see those layers building up over the textured wallpaper, and I just love the swirls of colour on your gorgeous fir tree. Lovely glimmering throughout, especially on the giant star. Great minds on the Paper Dolls, clearly! Very much looking forward to the next Skype playtime. A gorgeous project, the textures of the background are great. It looks a wonderful winter scene. 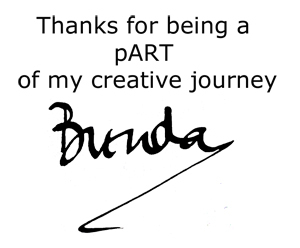 So lovely and so sweet Brenda! Completely gorgeous. . Love the vintage goodness and soft blue. Wow, this is really fantastic, Brenda! It was so fun to 'watch' you create with friends via Skype! Your colors are so beautifully and perfectly vintage, and I love the toothpicks! Such a charming scene! Wishing you and your family and lovely and warm Christmas and many blessings in the New Year! I always love the way your mind works and the beautiful art that flows from it! This is no exception. Beautiful! Happy Christmas! Blessed New Year! 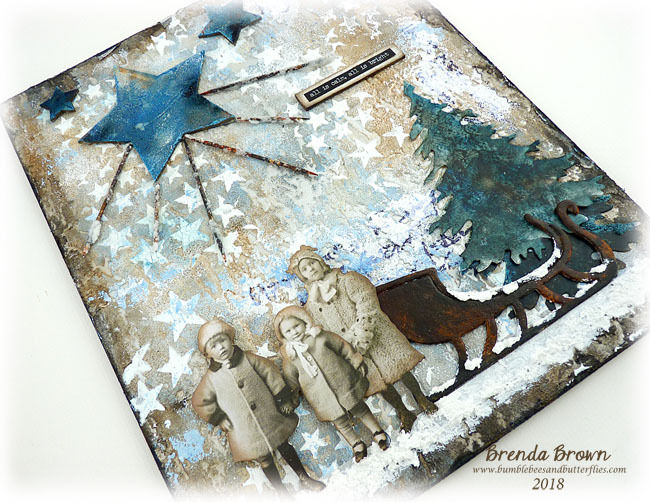 A fabulous way to create Brenda, I did something similar to this a year or two ago and those prompts have always stuck with me. You've created an amazing scene one to bring out each year. 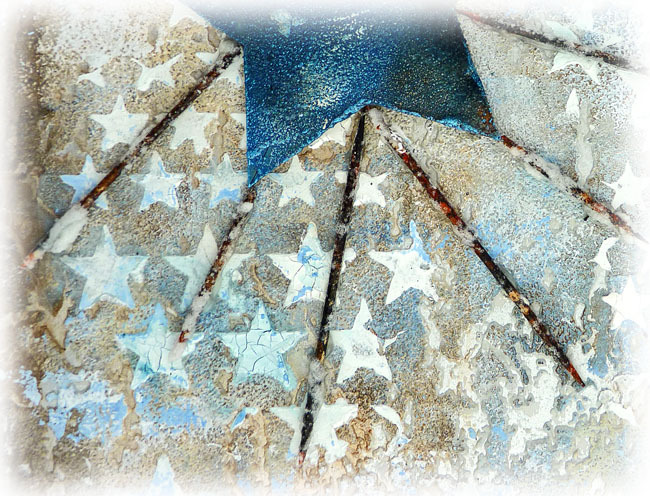 Love those BIG blue stars! !